Hello Cottage Friends and welcome to another edition of Living Large In Small Spaces. 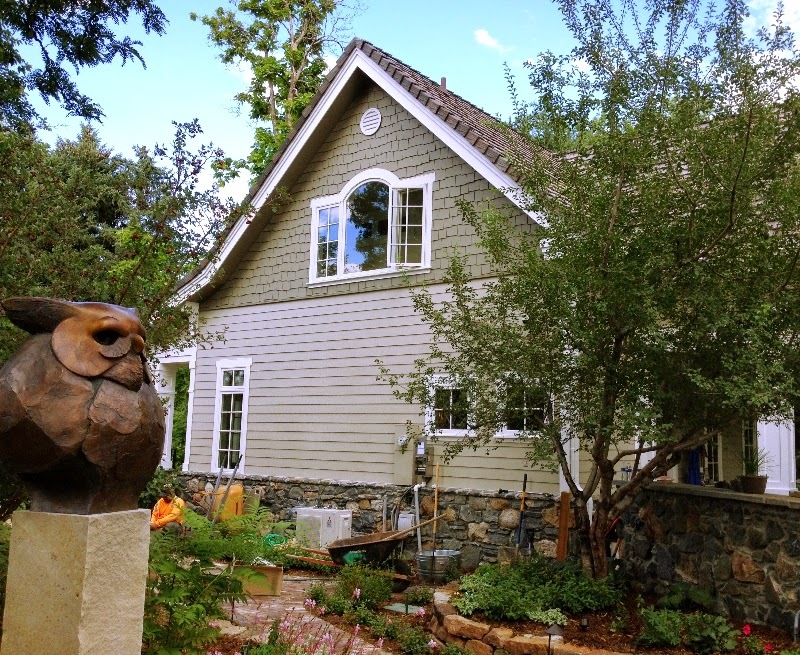 Two months ago I featured the fabulous Mountain Cottage designed by TKP Architects of Golden, Colorado. Karen Keating, President of TKP, told me about another small home they had designed called Bailey Cottage. I'm pleased to share it with you today. Karen says the 1,037 sf cottage "was designed to be a temporary house while the Owners designed and built their 'big' house, but they like it so much that they have never built the 'big' one." 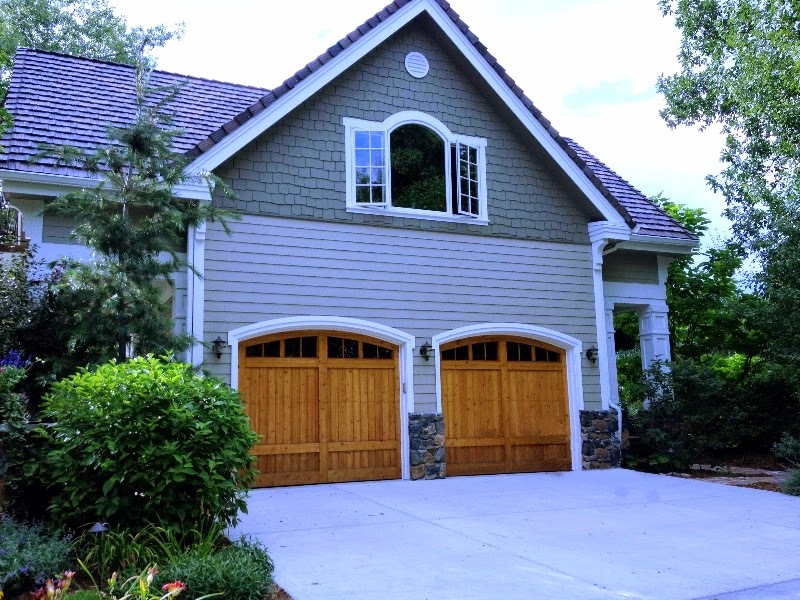 A two car garage comprises most of the first floor, along with the powder room -- which is also conveniently accessed from the patio -- the mechanical room, a storage closet, and interior stairs to the second floor living space. 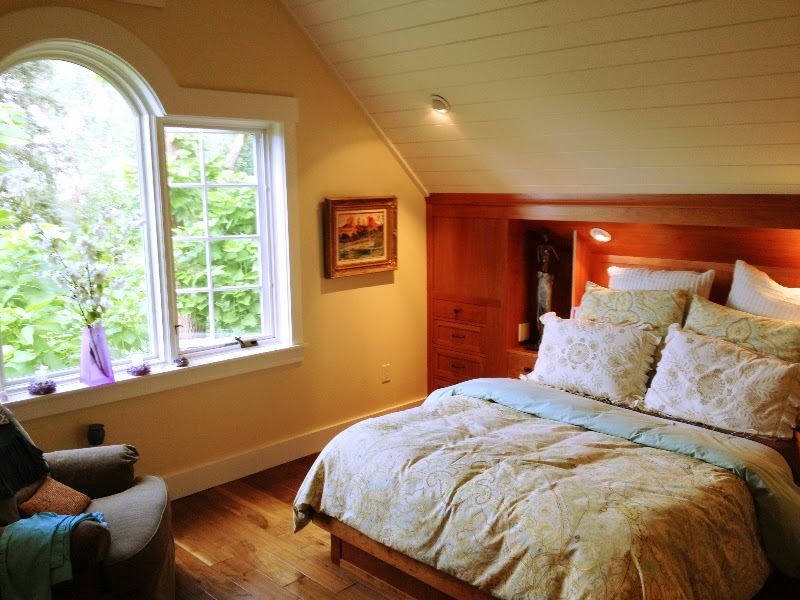 Palladian windows in the home's gables allow natural light to flow into the rooms. Glass front kitchen cabinets maintain the open feel of the great room. The vaulted ceiling affords space for a second row of upper cabinets, providing extra storage. The bedroom is tucked under the eaves. The window offers great architectural detail, not to mention a beautiful view of the grounds. The bathroom (not shown) is adjacent to the bedroom and backs up to the kitchen wall. 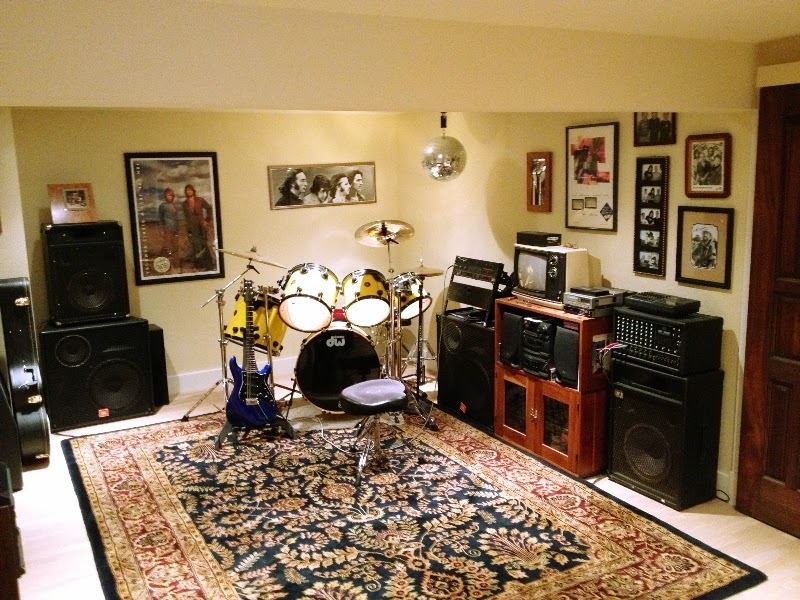 This home has a basement which houses the music room. 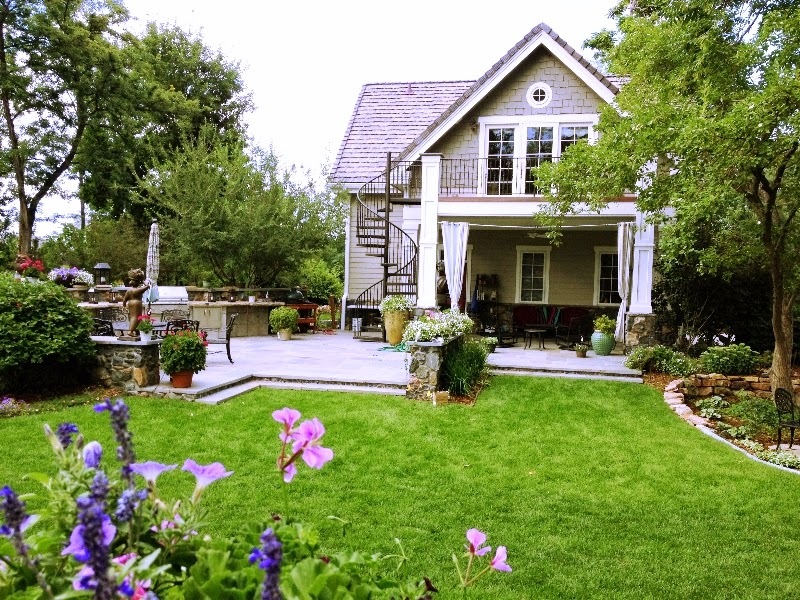 Small homes live larger with outdoor "rooms" and Bailey Cottage has plenty of those. 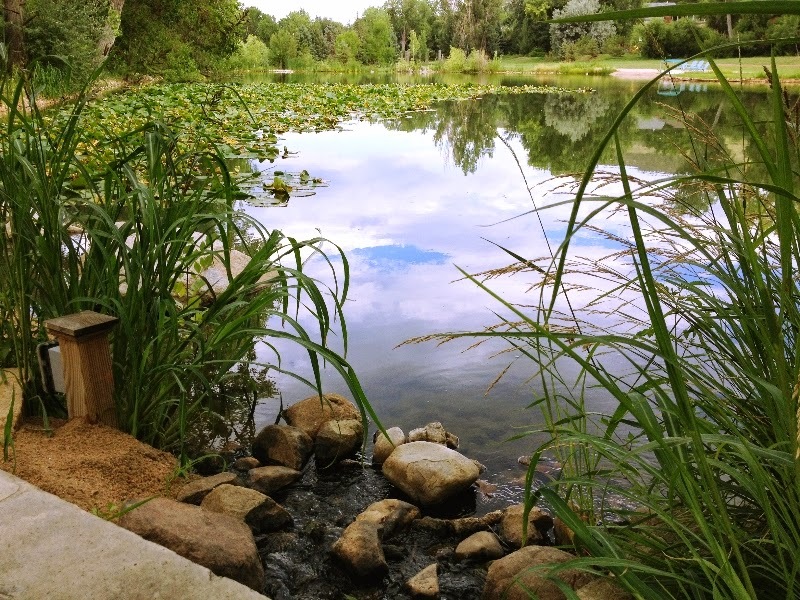 The result is a tranquil retreat. Classic architecture in a park-like setting. It's so easy to imagine living large in this small space. I received no compensation from TKP Architects for featuring Bailey cottage. I'm sharing it because it's a wonderful example of a small home that lives large. All photos are the property of TKP Architects and were used with their permission. oh my. ooohh my goodness this is lovely. in planning our retirement we're looking for a smallish home. haven't decided where ..
we've gone from 2400sf to 1400sf and are hoping to reduce that footage to 1000sf. what inspiration this and others you've share, are to us to who are seeking to live smaller. Once again you've whetted my appetite to have a smaller home! Mine is between 1100-1200 square feet, but my heart longs to go smaller. You are so encouraging and such an inspiration - you've made living large in small spaces so appealing! 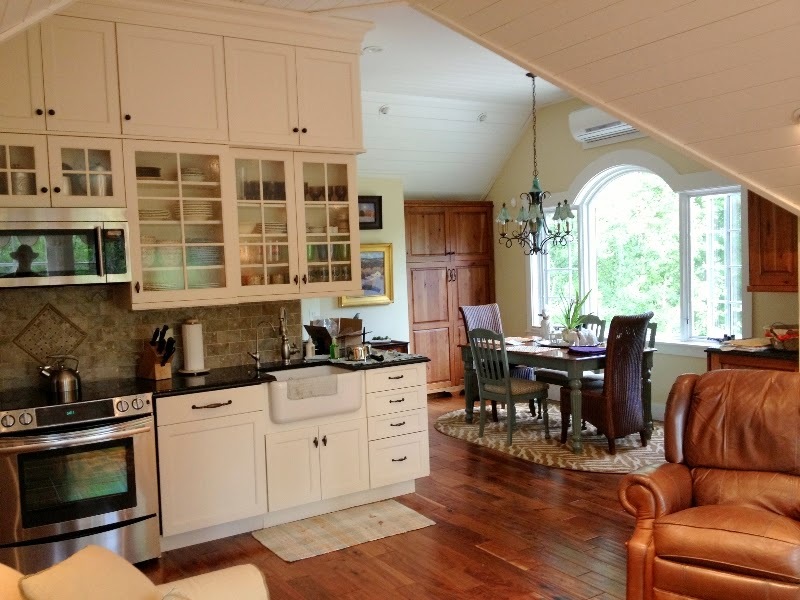 This house is awesome - the upper level kitchen cabinets are a fabulous storage idea. The windows are beautiful and who would have ever imagined a house this size could/would have wine and music rooms - love it!!!! The front porch is so elegant with the thick posts. 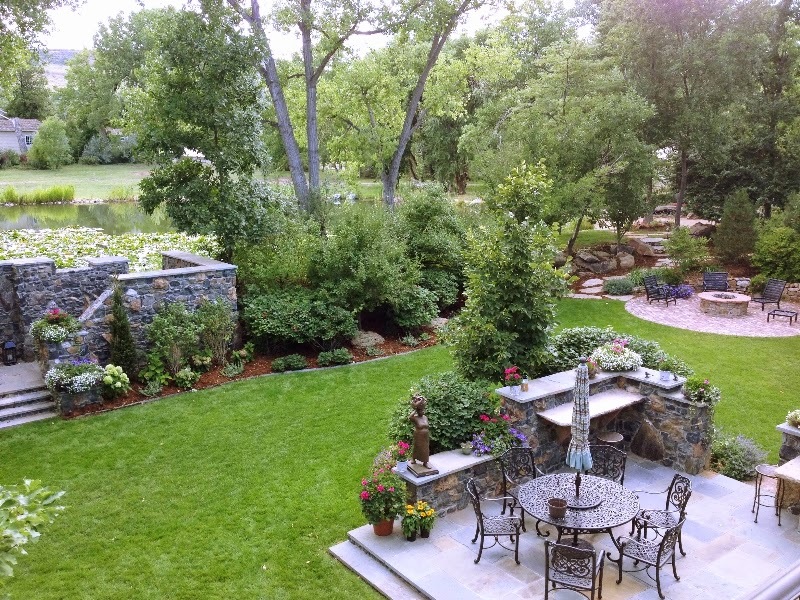 Most of all though, the garden - what a wow factor with the entertaining areas, the stone walls and water features, and the natural pond as a background. All I can say is, no wonder they didn't build a second house - how would it be any lovelier than this one? Thanks for sharing this with us Nancy. Natural interior beauty and that incredible owl that beckons and welcomes you! 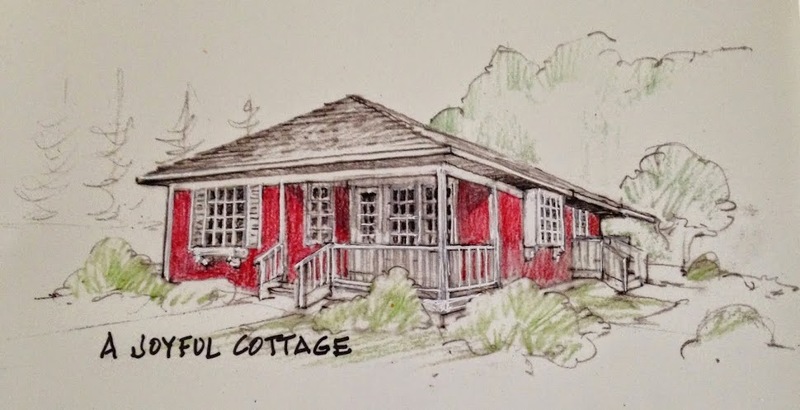 Another fabulous 28th cottage post!!! 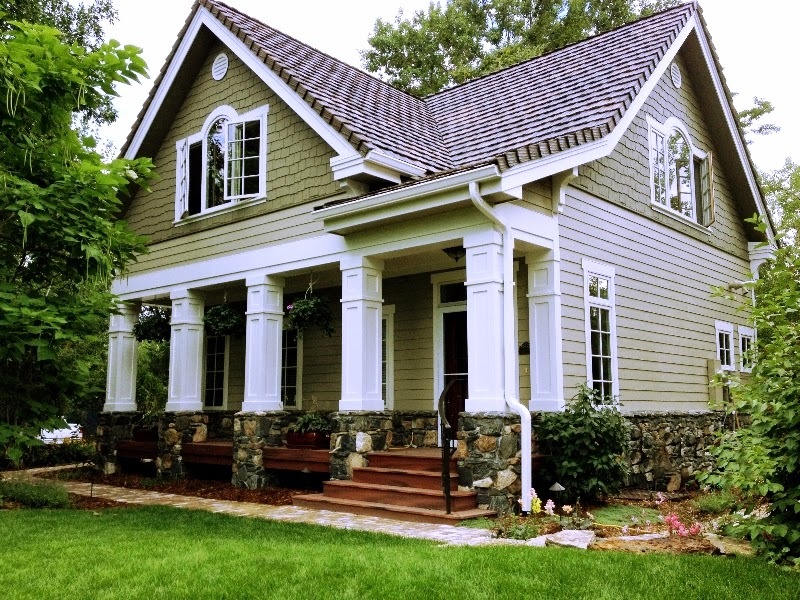 LOVE the exterior of this home, Nancy, with the updated Victorian feel. Inside, it's just as charming with plenty of storage space, which is both pretty and practical. Add to all of this, the beautiful outdoor spaces and you have winning cottage-y cuteness! 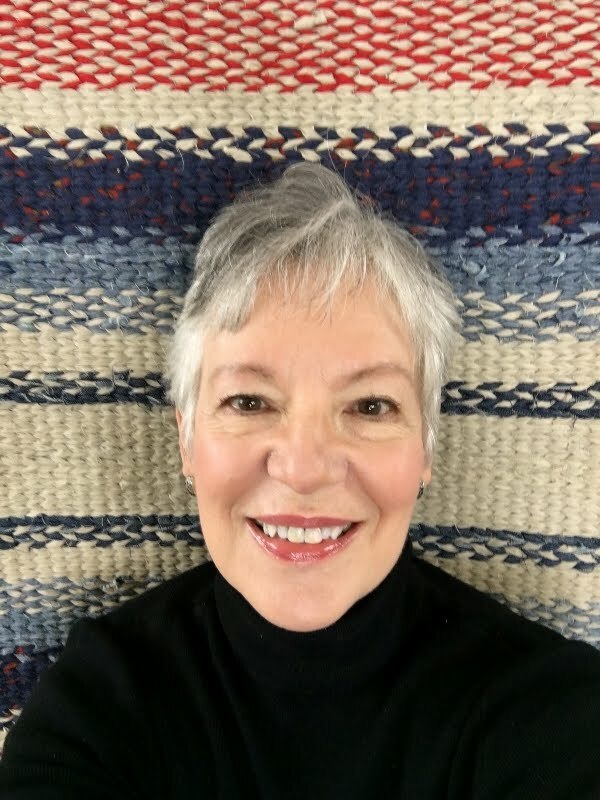 Thanks for sharing; I so enjoy this fun and informative series! Such a cosy and charming home and stunning to look at, but the garden is definitely something to lust after, I'd want to live outdoors as much as possible if I lived there. Wow that is just beautiful. Golden is such an unique town. Oh my heavens, that garden is truly a delight! Loved each photograph, indoors and out! All amazing! I love the gardens. :-) Cool music room. I like the decor. Hi...what an amazing place..inside an out..i can say i fully understand why they're happy in the cottage..the outdoor space is so inviting..a fave mag. an a tall glass of iced tea..or a mint julep would taste so good in that garden..add a hammock an well what i can i say..their kitchen is so nice..as is the Beatles pic in the music room..Thanks for sharing the homes you find. Wow, they sure packed a lot into this little house, it's amazing. The beautiful grounds are the icing on the cake! Absolutely STUNNING indeed Nancy! Cottages kept up and enhanced to uplift the spirit have to be my favorite types of homes. 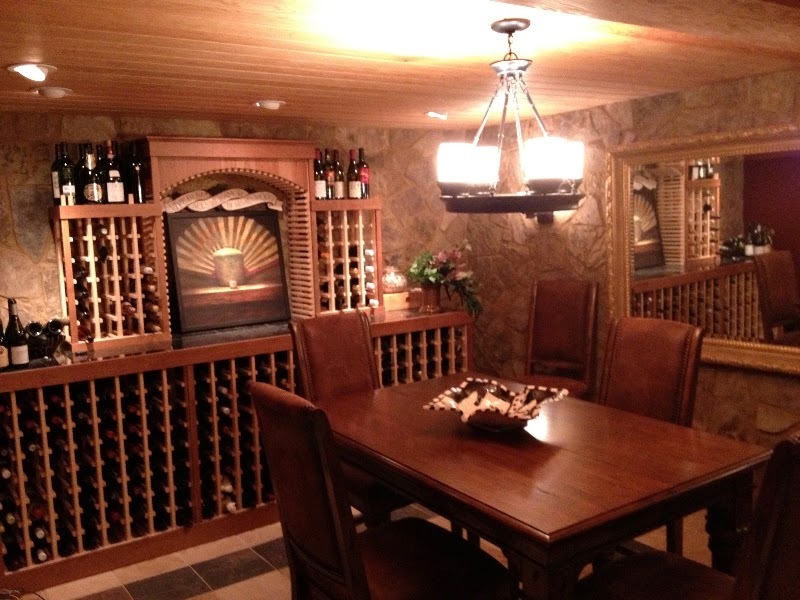 Large homes are fine, but a manageable house with cozy features such as this are what I call H O M E.
Wow Wow Wow! I think this is going to be one of my faves from your series. I could move right in. 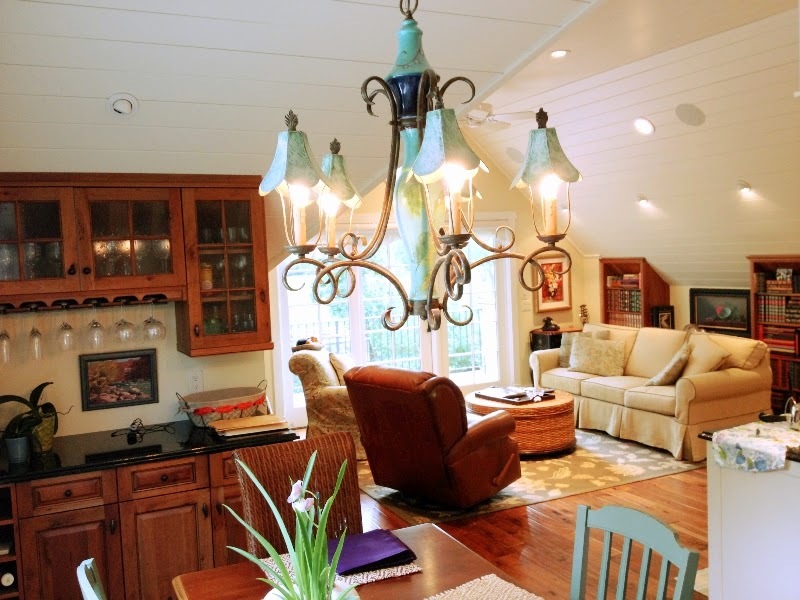 How gorgeous this cottage is and every detail so pretty and comfy and cozy. This proves you do not have to have a big ole house to live large. Sooooo beautiful. Thanks for sharing Nancy. What a beauty . . . who would want or need more . . . The gardens and "extra rooms" are magnificent . . . I see a few ideas here for my "someday" farmhouse! ...Isn't it interesting how many times people build a small house to live in while building the "real" one... only to find they don't need the big house after all? I would not want to leave this beautiful place either! Life would be worth living there! I love the kitchen and the windows! You know I love in a tiny cottage so I really enjoy your series. Enchanting. Wonderful gardens, I want to live here. Oh this home is positively DREAMY - I would live there in a second. WOW, it's absolutely stunning. What a beautiful property! I can see why they just forgot about building the "big" house! Who wouldn't want to just keep the welcome home mat out at this front door! So pretty!! The indoors is amazing. Outdoors ? Like a beautiful park! Just gorgeous! 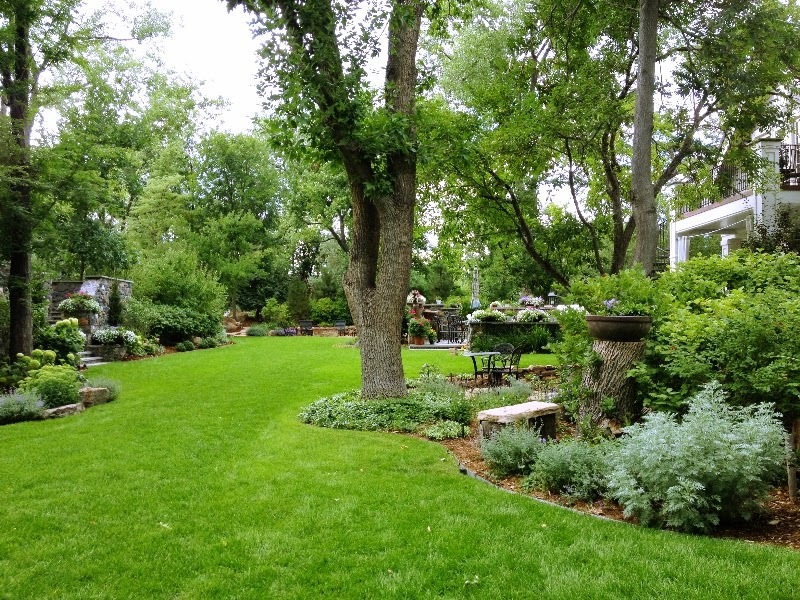 I'd love to be strolling around those outdoor garden areas. Wow. Absolutely incredible. 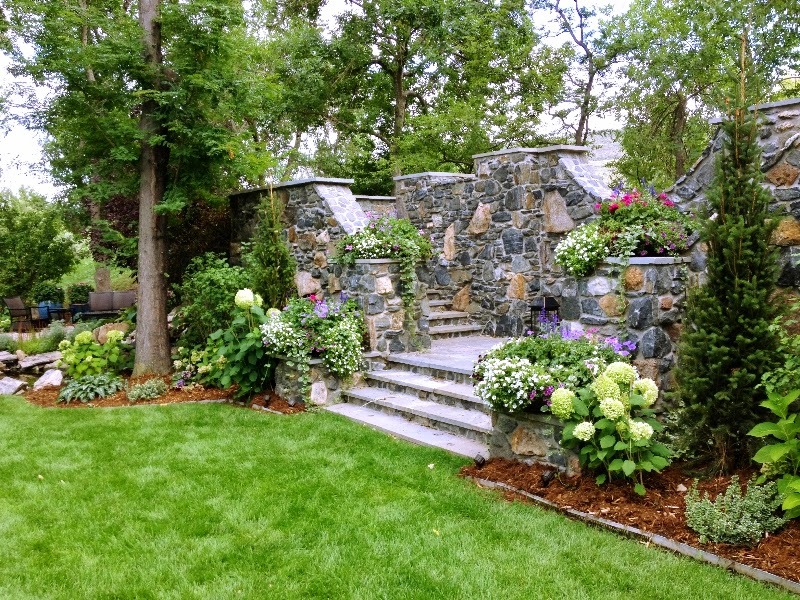 I think the outside is my favorite, just love the gardens, and I loved the white colors balanced out with the dark wood. Absolutely delightful! Really enjoying this series Nancy - it is so neat to see what other people have done with small spaces! STUNNING inside and out!! The grounds are amazing!! Gorgeous. I should think they would be satisfied with the cottage -- it is more like a tiny castle. Very cute. Wow! Love the architecture and the garden spaces are amazing! I live close to Golden, Co, and this house is perfect and very reminiscent of vintage cottages in Denver. It really is charming. 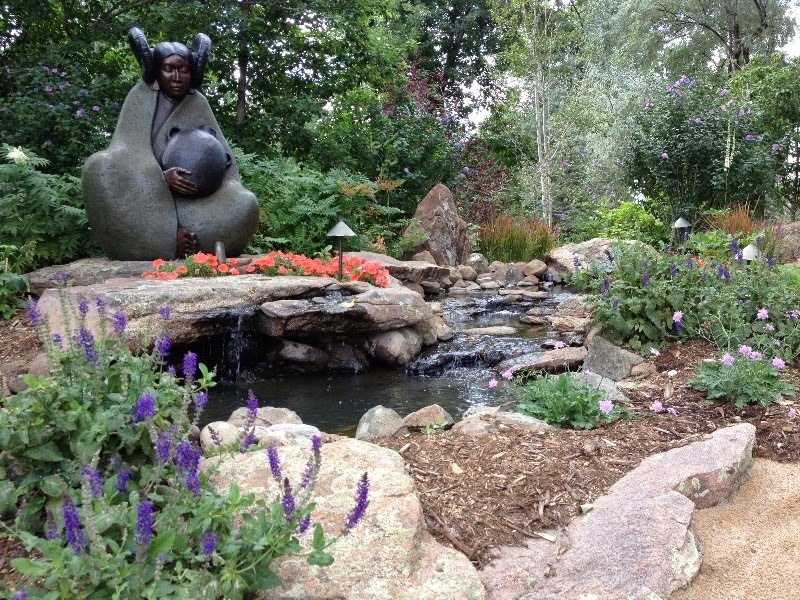 The owners have made their backyard a moni paradise! Oh my...this is one charming home!!! Oh my gosh Nancy, I love this home! The gardens are gorgeous and I could just live in them. lol! Thanks for sharing it with SYC. Hi Nancy, just hopping back to let you know that I will be featuring you at SYC this week. 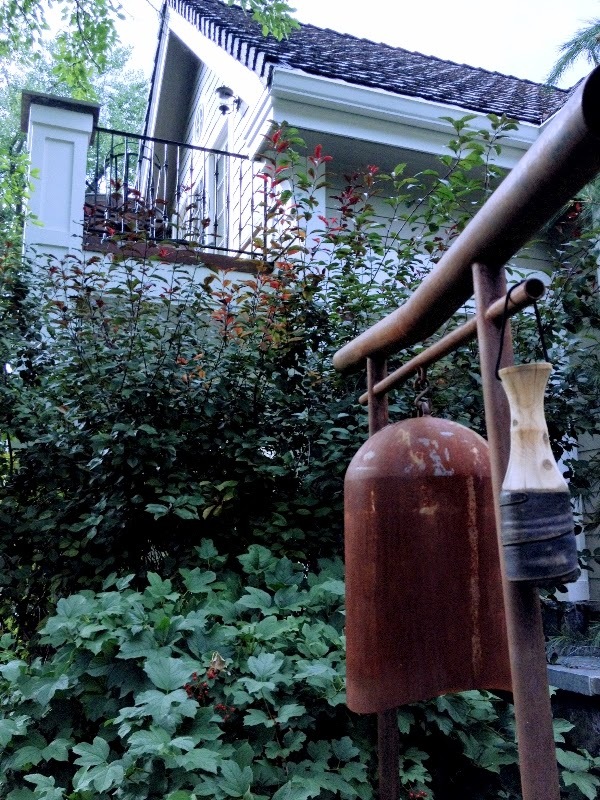 The house is beautiful, but I am totally enamored of the garden. Stopping by via Jann's feature. Oh my! That is just about perfect! Luv it! Nancy, love this cute little house and the pretty gardens around it!